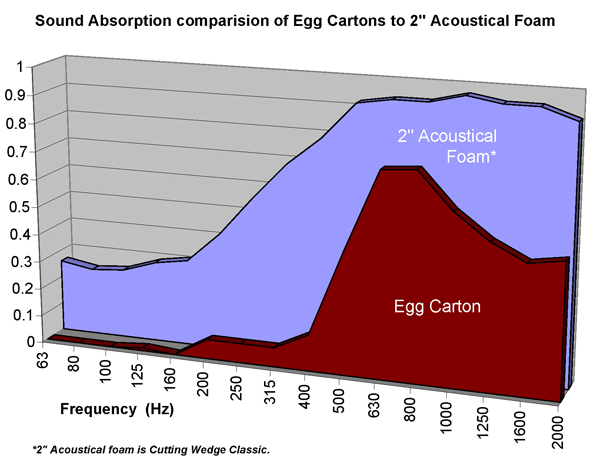 Acoustic Myths & Realities - Can Egg Cartons be used as an acoustical treatment? 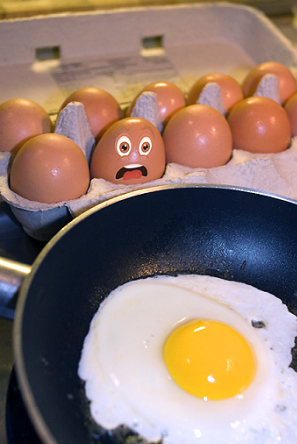 Acoustic Myths & Realities: Can Egg Cartons be used as an Acoustical Treatment? Since entering the acoustics arena in the seventies, we have heard many stories over and over. One of these is that egg cartons can be a substitute for acoustical foams or other sound absorbers as an acoustical treatment for use in broadcast & recording studios or other critical listening environments. After listening to this many times, I decided to include formed paper egg cartons with a test of some commercial products at Riverbank Acoustical Laboratories. Egg Cartons do, indeed, have acoustical value. They measure NRC = 0.40. However, the graph tells the rest of the story. While commercial products exhibit a smooth curve, there is a "pothole" in the acoustical road with egg cartons. Another thing to consider is flammability. Take an egg carton outside and put a match to it! Then ask yourself, "Do I still want this on my studio walls?" *NOTE: IF YOU WISH TO REFER TO THESE TESTS, PLEASE CREDIT ACOUSTICS FIRST® CORPORATION AS THE SOURCE. WE CANNOT AUTHORIZE USE OF THE "RIVERBANK" NAME BEYOND OUR REPRODUCTION OF THEIR ORIGINAL REPORT. This system is specifically designed for critical listening environments like recording & broadcast studios and music production spaces. The materials available in this acoustical system allow you to create a unique sound environment and give you the ability to augment your sound and tailor your sound as needed. This panel system is a quick and easy acoustical solution for any space. These uniquely sized panels can be painted on site to match or complement any color scheme. The Sonora® Series of Glass Fiber Absorbers includes acoustic Panels, Clouds, Ceiling Tiles, Corner Bass traps and Baffles. In a variety of colors, sizes, shapes and applications, the Sonora® Series can meet many of your sound control and noise elimination needs. Sound Channels® is a dimensional fabric that offers excellent acoustical properties, unmatched fade resistance, and more.